Cougs start the season ranked for the first time in 17 years. 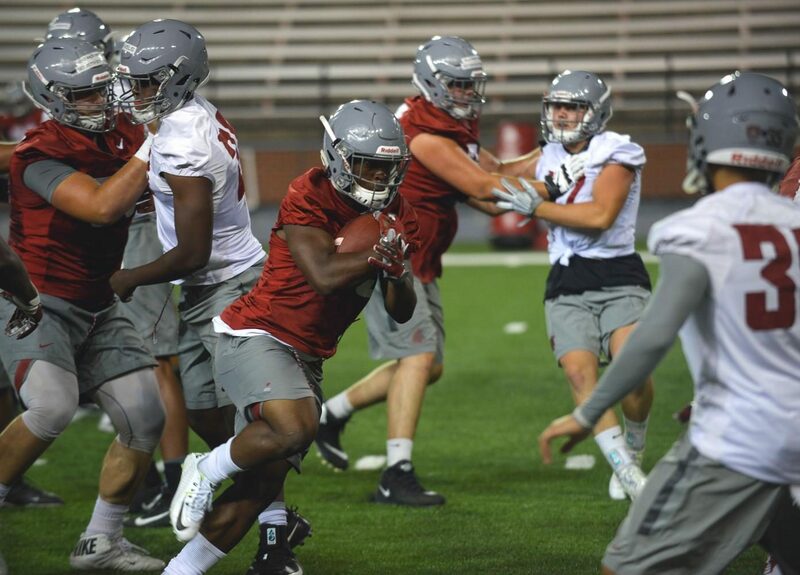 Redshirt senior number 25 Jamal Morrow runs the ball at the preseason practice on August 20th at Martin Stadium. For the first time since WSU went to the Rose Bowl in 2002, the Cougars were included in Associated Press’s top-25 pre-season rankings. This is the third time in history that the program has been ranked to start the year. WSU was ranked No. 11 in 2002 and No. 15 in 1952, making this the first time in the Leach-era the Cougars will start a season in the top 25.The Cougars narrowly missed inclusion in the top 25 preseason Amway Coaches Poll released earlier this month, coming in behind Utah at No. 26. WSU lost the first two games last season and slid backward in the standings. However, an eight-game winning streak pushed the program into contention with UW for the Pac-12 North title. The Cougars scored an average of 46 points per game during that run. WSU finished last season with a loss to Minnesota in the Holiday Bowl for a final record of 8-5. The team earned 133 points in the poll and is one of four Pac-12 teams in the top 25. No. 4 USC, No. 8 UW and No. 14 Stanford all came in ahead of WSU. The Trojans are scheduled to visit Martin Stadium during the last of five straight September home games. Stanford comes to Pullman during the first week of November, and this year the Apple Cup will take place in Seattle. The poll marks the first time in 15 years both WSU and Washington start the season ranked in the top 25. They will face Montana State at home on Sept. 2 to begin the 2017 season. WSU has not won a season opener since 2011.